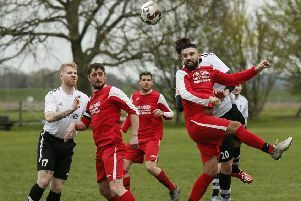 Barton Rovers were convincing 4-0 winners over AFC Hayes in their Southern League Division One Central clash on Saturday. The game was brought forward to a 2.15pm kick-off due to problems with the home side’s floodlights. Joint managers Richard Wilmot and Wes Byrne made one change to the starting line-up from the side that beat North Greenford, with Keshi Anderson returning after having a trial at Norwich City. Despite the wet and heavy playing surface, Rovers came out of the blocks full of energy with early chances for Rhys Hoenes, Anderson and JJ Brown. The breakthrough arrived from the penalty spot on 13 minutes when Hoenes’ mazy run was ended illegally in the area as the hosts were reduced to 10 men. Set-piece expert Kev Kilroy stepped up to coolly convert his third goal in as many games. Several chances went begging for Rovers as home keeper Sam Mazurek pulled off some fine saves to keep his side in touch at half time. However, moments into the second period, Barton had their second when the much sought after Anderson buried a fine strike from a narrow angle. From then on it was all one-way traffic and the scoreline could have been in double figures if it wasn’t for some heroics from Mazurek in the home goal. Anderson, who now has 16 league goals this term, hit the post and then the bar, while Mazurek pulled of point blank saves from Hoenes and Bilal Hassan. Connor Vincent hit the post and saw an effort cleared off the line, while controversy ensued when Anderson netted only to find the goal disallowed for a foul on the goalkeeper. It mattered little though as Ben Sawyer made it 3-0 on 87 minutes. There was even time for an extra gloss to be added to the scoreline as Luton Town U18s striker Tuki Tayali bagged his first goal with a powerful header. He came close again immediately afterwards, but put his effort over the bar. Rovers travel to AFC Dunstable tonight in the Beds Senior Cup before hosting eighth-placed Uxbridge on Saturday. For the reacton of joint boss Richard Wilmot, see the News/Gazette on sale now.